284 pages | 5 B/W Illus. "Feldman and Yates have written a dramatically wonderful book. In some ways the book is "written" by the real-life accounts of the individuals who contributed their stories, but the scientific knowledge that accompanies the stories is fantastic. People who fake illness anger and disappoint family, friends, and physicians. Empathy and compassion for these people does not come easily; however, reading this book will not only open your eyes regarding the illness from which the people suffer, it will enable you to offer them the emotional support they deserve." "This fascinating book pulls the veil back on one of the least understood conditions in psychiatry. Typically misunderstood, resented, and even reviled by the health care professionals, family members, and others who have been manipulated by their deceptive behaviors, these in-depth case studies go a long way towards helping to promote understanding and empathy for the extreme psychological suffering that is the at the root of this condition." "As junior clinicians we are taught to listen to and believe what patients tell us. But what do we do when the patient’s account is not consistent with test results or third party descriptions? In this fascinating book, which includes chapters on fabricated and induced illness in children, cyber-deception and Munchausen by animal proxy, Feldman and Yates use extensive first person accounts to highlight the rich clinical material. In doing so they encourage us to think beyond conventional therapeutic relationships and to confront the ethical and professional dilemmas posed. In considering what motivates people to fabricate or deceive they introduce us to potential ways of trying to understand and manage these complex needs." "'How could a mother do that to her child?' 'Why would people deliberately make themselves ill?' This book provides insight into these questions through first-hand narratives that are accompanied by the informed and thoughtful analyses of Dr. Feldman and Mr. Yates. Dying to Be Ill is a must both for professionals and anyone else attempting to understand the perplexing world of medical deception." "Dr. Marc Feldman is a widely acclaimed expert on factitious disorder – a condition that is often missed in clinical practice, causes tremendous suffering, and is very challenging to treat. This new contribution from Dr. Feldman is a fascinating and very valuable contribution that sheds important light on this often-misunderstood mental health condition." 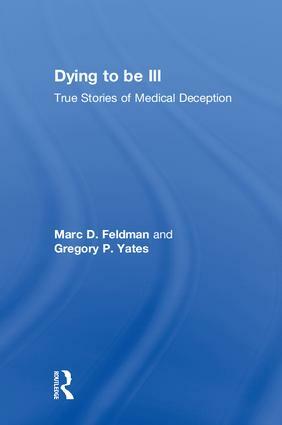 "In Dying to Be Ill, Marc Feldman and Gregory Yates examine illness deception with utmost clarity. It is rich in clinical material that illustrates the complicated features of illness deception. They elucidate the factors associated with the disorder, its multivariate forms, and the impact it has on others. They then proceed to clarify various treatment approaches for this challenging condition. This book represents an impressive state of the art overview from Dr. Feldman who has established himself as one of the world's foremost experts on illness deception." "Dying to be Ill makes a significant contribution to the literature by documenting the lived experience of people who suffer with a disorder that has been neglected by the healthcare and psychiatric communities. The narratives and first-hand accounts elicit compassion for, and remorse from, those willing to tell their story. It is time for the treatment of factitious disorders to move more toward the addiction, or disease model, while reducing stigma and shame that often deters those afflicted from getting much needed treatment." Marc D. Feldman, MD, is an international expert in medical deception. His work has been featured in more than 200 magazines and newspapers, and on television and radio shows worldwide. Gregory P. Yates, MA, is a prize-winning graduate of Oxford University and holds a Master’s degree from the University of Birmingham (UK). He is currently studying medicine in the UK.